Creating wireframes is easy with the ProtoShare wireframing tool. You can use ProtoShare’s component palette, the prebuilt wireframe stencils library or your own images & designs for your project. You can also create a library of reusable Templates, Masters, and Assets for increased productivity and consistency across teams and projects. Start out simple with grey box wireframes so team members and stakeholders can visualize ideas early in the process. 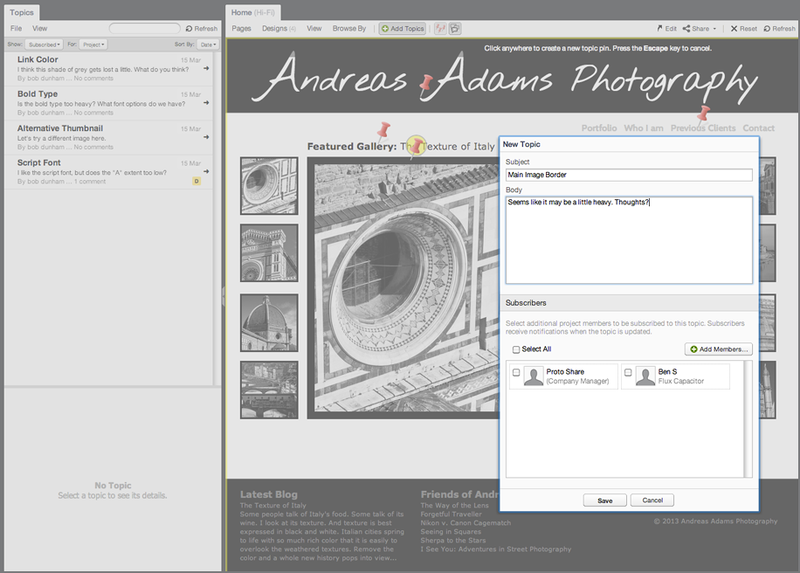 Use the built in collaboration for feedback, idea generation and to document decisions. If a high fidelity, fully-fledged prototype is needed, you can create a pixel perfect project that functions like a real website or application. Save time by re-using work created in ProtoShare. 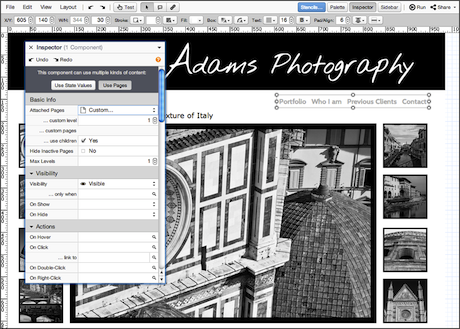 Build Masters and Templates to use across pages, or even across projects. The easy-to-use drag-and-drop wireframe editor with a large and growing Stencils and Widgets Library makes prototyping fast and simple. States enable quick and easy creation of simple to complex interactions like pop-ups, light boxes, carousels, tabbed panels, and much more. Want a quick solution? 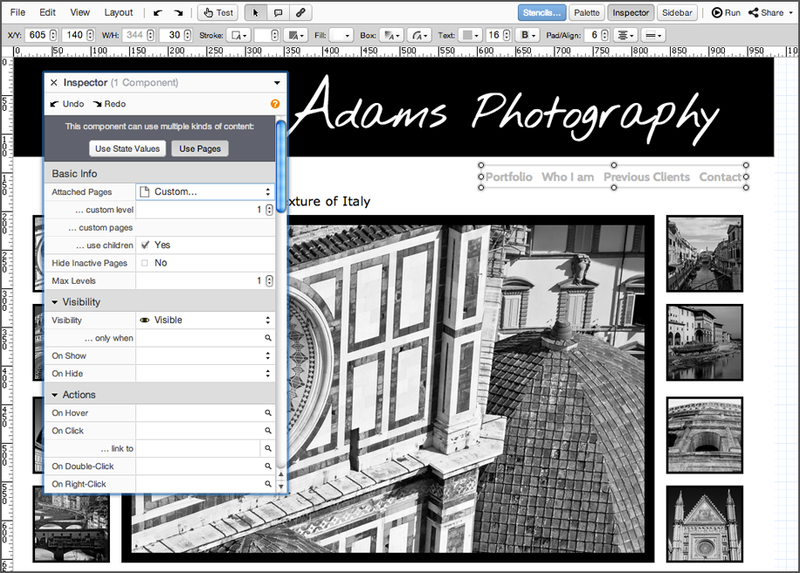 Just drag and drop library items directly onto your canvas to make use of our fully-interactive widgets. Quickly create interactive mobile prototypes that users can experience directy on their mobile device. Use pre-configured mobile screen guides for iPhone, iPad and Android devices and pre-built mobile Stencils & Widgets to simulate animated transitions to rapidly generate your mobile app. ProtoShare is easily incorporated into your existing process and will help improve efficiency. Every screen, page, annotation and discussion topic has a unique URL. Link directly to your prototypes from JIRA, Rally, and other project management & tracking software. If you're not sharing, you're not prototyping. Early project collaboration through ideation and prototyping ensures your team will create better solutions and reduce project waste and rework. 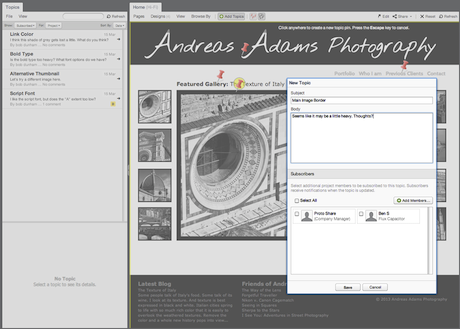 ProtoShare improves your creative process through managed collaboration. Share ideas, gather feedback and refine designs. Make decisions. Build spectacular solutions. ProtoShare supports low, medium and high-fidelity prototypes, clickable comps, and live views for collaboration. Collaborate with your team and clients using real-time discussions. You can direct topics to only the stakeholders that need to be involved. As topics are added, participants receive email notification of a new topic with a link directly into the specific project and topic. Red pushpins represent comments and topics of discussion on a design. When you collaborate with others on a project in ProtoShare, you can add topic pins or respond to other people’s topic pins. All discussions for the current project can be found in the Topics panel. Keep everyone up to speed on proposed designs by allowing them to contribute to the process using the powerful collaboration that ProtoShare offers. All stakeholders can work in the same environment at the same time, or on their own schedules and all feedback is stored in a single location. Having feedback in one location allows you to mark topics with decisions and resolutions. There can be multiple decisions in a discussion thread but only one resolution. A resolved topic means it is closed to further commenting and all decisions have been made.